Vin Scully, the longtime Dodgers announcer, took over the team's Twitter account ahead of the 100th Rose Bowl. 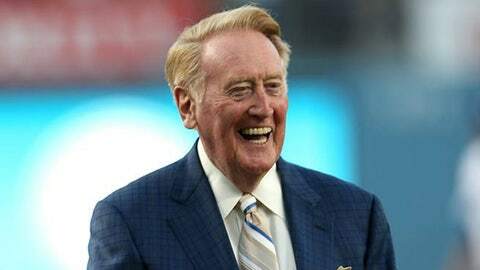 After 65 years, what’s Vin Scully’s favorite Dodgers moment? Why, the 1955 World Series title, when the team still called Brooklyn home. Scully, the longtime Dodgers announcer, took over the team’s Twitter account ahead of the 100th Rose Bowl where Scully will serve as the the Rose Parade’s Grand Marshal on Jan. 1. I started calling games in my head when I was playing stickball with the boys. Then would holler a little play-by-play from my apartment.
.@vincebase5 probably the '55 World Series. That was the only one the #Dodgers ever won in Brooklyn. That was probably the most momentous.
.@TBrownYahoo When I was asleep my dad would go to the tree lot & bring a little tree to the apartment and he & my mother would decorate it.